MARRY A GIRL BELOW 18 YEARS OLD AND FACE GOVERNMENT WRATH! TO end the prevalence of child marriage especially in the North, the Federal Government has pegged marriage age for girls at 18. Marrying off girls below the age will now be frowned at by the government, Vice President Yemi Osinbajo said yesterday. 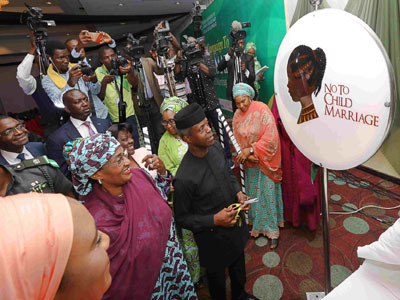 Osinbajo gave the directive yesterday at the launch of a strategy document and campaign by the government against child marriage in Abuja. He blamed the increasing rate of child brides on poverty, saying there was an urgent need to tackle this issue. He assured Nigerians that the government would take concrete steps to ensure the compulsory education of girls. “There is a positive correlation between child marriage, poverty and Illiteracy. The states with the lowest level of illiteracy have the highest rate of child brides. “Nigeria has made fairly poor progress in ending child marriage, 24 states out of the 36 states have passed the Child’s Right Act, but implementation is yet to be done fully,” he said. The VP expressed regrets that there was no penalty for child marriage in the Constitution and urged the citizens to change their mindsets, especially as it concerns child marriage. “We must persuade all Nigerians to stop this through advocacy and more campaign against it. States without provisions for girl-child education should consider this and also enroll girls who dropped out of school due to early marriage,” he said. Minister of Women Affairs and Social Development Senator Aisha Jummai Alhassan said six million girls were married by the age of 15 in 2015, adding that child marriage is extremely prevalent in the northwest and northeast geo-political zones. According to her, northern girls account for the highest rates of early marriage in the world with an estimated 65 per cent of children married off below the age of 18years. “The detrimental consequences of child marriage on children, women, families, communities and nations at large are evident. There are always high maternal mortality and morbidity, illiteracy, lack of skills, unemployment, low income and wide spread misery among the victims of child marriage especially female victims,” she lamented. United Nations (UN) Resident Coordinator, who was represented at the launch in Abuja by Muhammed Malik, said 23 million Nigerian girls were married off before 18 years. The UN, Canadian government and other leading health organisations, he assured, were supporting the policy. “As United Nations (UN), we are proud to support Nigeria as the 16th country to move to end child marriage, as part of the Sustainable Development Goals that we have pledged to achieve by the year 2030,” he said. Previous Who Will Rescue Osun PDP… As Omisore Romances APC.